What do you think of such a dubious statement?Its even more worrisome to note that it was spoken by an academic.Some people we call academic doctors…..
Because of this statement and the many other barriers that women face in trying to pursue careers in aviation, It was my pleasure to present on a topic titled ‘Yes Women Can Fly’. Although it’s been slightly over two weeks since the event, I still feel an excitement in my spirit as I remember all that interactive discussion we had. The main aim of the presentation was to share some positive ideas that can help increase the number of women pilots in the world. It’s quite sad to note that of all the pilots in the world, only 6% are women. Are women just not cut out for flying? Are they always scared? Is it true that women have less physical abilities than men? Using a well designed Powerpoint slideshow, I responded to all such questions and emphasized that no woman is kept disadvantaged in pursuing any career of her choice.Men do have a monopoly of success.I made sure that the atmosphere at the presentation venue was “female friendly”.So I adorned the small hall with colorful photos of successful, smiling female pilots getting in airplanes and at the controls, instead of the cold, framed art of phallic symbol jets and rockets barreling through the sky with no people in the pictures. At the end of the presentation, we had a very interesting question and answer session. I learnt that women are generally more social than us men and it is easier to communicate with them on issues that concern them. 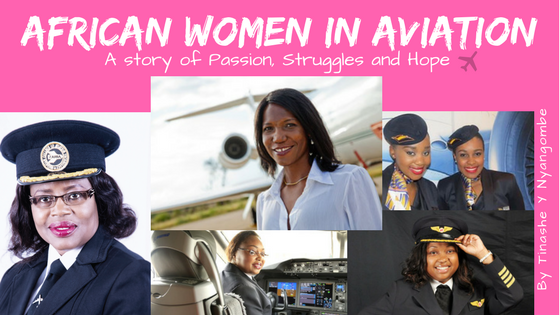 When we were talking about why some certain jobs like flying are more male predominant, a young woman asked me “Are we as women inferior to men?” My response sparked some bit of debate – I told her that we are created equal, both male and female.No one is inferior to the other but we have different responsibilities. We had fun, we enjoyed, we learnt, we shared, we discussed and most of all we learnt that Yes Women Can Fly! Should you want me to share the rest of the report with you, or if you request some more photos/notes and even a video of the event, kindly email me on pilotyadley@gmail.com.